Tocardo Tidal Power have burst onto the tidal scene in the UK with the InToTidal project kick-off and the arrival of Tocardo’s system in Orkney. The system arrived at Hatston Pier in Kirkwall last Monday [13th February 2017] in preparation for it being deployed at the European Marine Energy Centre’s (EMEC’s) grid-connected tidal test site. It is the start of Tocardo’s planned 20-year commercial demonstration project at EMEC’s Fall of Warness tidal test site. 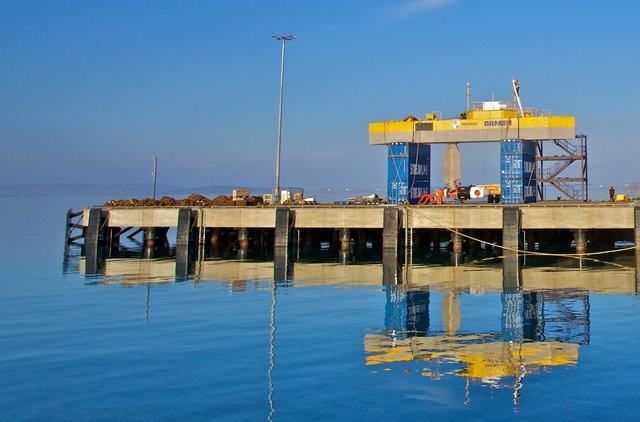 With the installation at EMEC’s site, Tocardo is readying for large scale roll-out of its generic solution for tidal energy production. The next installation is foreseen in Canada at the FORCE and Petit Passage locations. Led by Tocardo, the project brings together Orkney based companies EMEC and Leask Marine, and French research institute IFREMER. Tocardo has already been working with international shipyard DAMEN, as well as Leask Marine, Bryan J Rendall Electrical and Aquatera in Orkney for the system deployment at EMEC’s tidal site. “Our work at EMEC is an important step in de-risking and improving Tocardo’s offshore tidal power technology. “Tocardo’s benchmark is to produce energy at the cost of offshore wind in the near future. To be able to achieve this, the tidal energy sector needs to be enabled to increase the installed volume of equipment. “In that respect it is important to see a support scheme suitable for the marine energy sector, to encourage technology companies like Tocardo to build out on an industrial scale in the UK. A revenue based support mechanism, decreasing over time, has proved to be best in creating a new industry through market incentivisation, as learned from, as an example, the industry growth of the Danish wind energy sector.